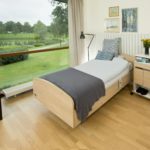 Historically in the UK a mobility bed, or profiling/hospital/nursing bed as they are often know, would be seen in a care environment, residential/nursing care or within a hospital. However, with the change in health and social care agenda for management of complex needs within the home environment it has become far more common place for mobility beds to be seen in normal community settings. Mobility beds are generally recommended by health care professionals for those who have significant physical needs. However, general purchase of such beds could be advantageous even if needs fall outside of the statutory criteria for provision. Increased angle of lie may aid breathing for those with a chronic respiratory disease. The increase in angle may relieve pressure and weight on the chest making it easier for the chest to move up and down without unnecessary effort. Research also suggests that lying at no less than 30 degrees may reduce the risk of community acquired pneumonia. In situations where the user is requiring support with moving and handling, including lie-to-sit, the ability to do this mechanically reduces effort and risks for care providers. 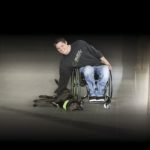 The function can make the difference between managing the bed transfer independently or requiring assistance, often which is unavailable through the night. Functionally allows the user to engage in meaningful activities of daily living such as reading, watching television, feeding, drinking, talking and engaging, particularly for those who will spend much of their day in the bed. The height adjusting feature is normally used for two specific purposes at differing ends of the ability spectrum. Healthcare professionals will often recommend a mobility bed when the person being assessed is able to perform an independent bed transfer from varying heights depending on which element of the task they are completing. For example, in my experience this tends to be for users who can stand from the bed at one height (normally relatively high), but only able to get their legs into bed independently from a lower height. Sacrificing one of these heights means that the user cannot get into and out of bed independently which is particularly problematic if they get up through the night as there may be no one to assist them or if there is this person will have many broken sleeps. The second main reason for recommending a bed with height adjusting feature is when complex moving and handling is involved. 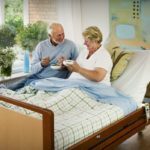 Carers may be hoisting the client or managing their care needs in the bed making the ability to adjust bed height to suit different carer needs more beneficial. Within statutuory services however this reason may not be used as justification for provision through NHS/local authority equipment store if the individual already has a suitable bed at an ‘appropriate’ set height at home with a robust handling plan in place. The thigh raise, or knee break as I have sometimes heard it called, is a critical yet underused feature of the 4 section mobility bed and as a healthcare professional myself I cannot emphasise enough how important it can be. The ability to create and adjust angles of pelvis, hips and knees has positive impact on posture. The same flexibility above may impact positively on risks of pressure damage. 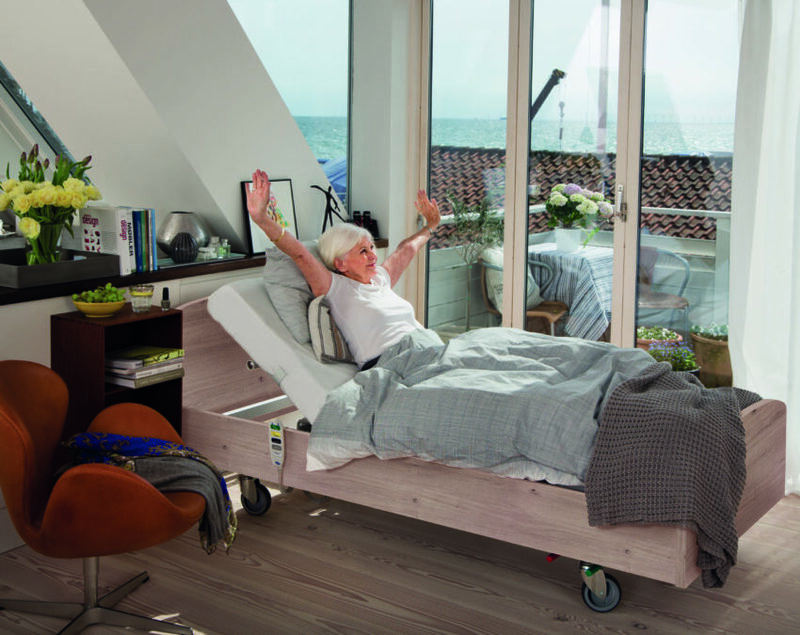 The Trendelenburg feature is not available on all mobility beds but effectively allows users, or predominantly their carers, to raise the feet higher than the head whilst the base of the bed remains flat. There are some medical reasons why this may be required but the main advantage of this for carers is that a slights decline can help them to slide the user back up the bed with significantly reduced effort, particularly if in conjunction with a glide sheet. The main focus should be in reducing this need however it would be naïve to think that repositioning up the bed will never be required regardless of what strategies are put in place to minimise it. As well as the integrated features listed above mobility beds come with any number of potential accessories including rails and grab handles to support independence or reduce risk.